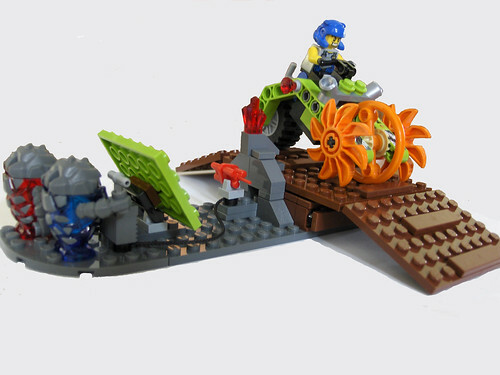 LEGO Star Wars Forum | From Bricks To Bothans • View topic - Power Miners Building Contest: Monsters' Revenge! 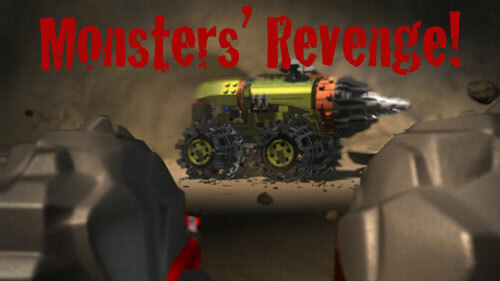 Power Miners Building Contest: Monsters' Revenge! To help kickstart the new direction of FBTB, we're holding a little contest dubbed "Monsters' Revenge". 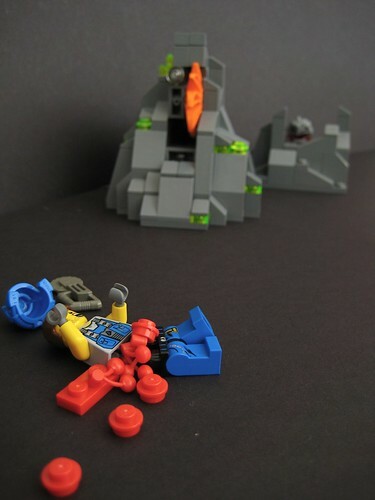 Many of the staff and I agree that the genocidal nature of the Power Miners is the tragic cause of the decline in the Rock Monster population. Though the Power Miners deny any wrongdoing, it is clear that they feel entitled to exploit the natural crystal resources for their own purposes, crystals that are actually a staple in the Rock Monster diet. To help the Rock Monsters defend what is rightfully theirs, we would like to request your assistance in building defenses and assault vehicles for the Rock Monsters to operate. All types of defenses will be considered, including devices, machines, small vehicles, booby traps, and bases. The Rock Monsters strategy involves ambush-style strikes, so please be considerate of size. Time is of the essence so your submissions (consisting of 1 photo with a link to a full gallery) must be posted to the contest thread by 11:59pm PDT Friday April 17, 2009. In order to assure that all parties involved are able to review and assess the combat-ready qualities of your submission, you must also send a copy of your submission to the FBTB: flickr Outpost tagged with "Monster's Revenge". The winners of this building challenge will be the Rock Monsters with the help of your submission, but their leaders have generously offered a captured Power Miners vehicle as compensation, as they are unable to pilot it themselves. I've been told the make and model of the vehicle is 8707 Boulder Blaster. Re: Power Miners Building Contest: Monsters' Revenge! I'm not eligible, but I started a sample entry last night. Too much fun. Should my entry follow the Power Miners color scheme? The focus is on the Monster's defense, so their color scheme is.. rock and crystal. Maybe some sticks. Any Power Miners vehicles you include will simply be window dressing on your entry. Unless maybe for your entry the Rock Monsters managed to steal and modify a PM vehicle? Can you enter more than one model? Commander Aero wrote: Can you enter more than one model? All entries will be considered but you are doing yourself a disservice. You, the builder, may get the most votes overall, but you can still lose the contest if none of your entries have the most number of votes. Get it? That Thunder Driller is about to become history. A few more seconds with his shrinking ray and Boulderax will be able to stomp on it and mush it into the ground. We don't joke about prizes. Prizes are srs biznss. the contest is real. deadline's been extended to april 17th. I'm pretty sure I know the answer to this question, but - Is it preferable to showcase our defensive weaponry/vehicle/etc being actively employed by Rock Monsters to bring Power Miners to a gory demise, or are we showing the Rock Monsters by themselves? I will take that to mean gory Power Miner deaths are preferable. Thanks for clearing that up onions. I was thinking about doing one for Firox and another one for sulferix. But after going to the lego store today I decided I'm only going to make a vehicle for Firox. 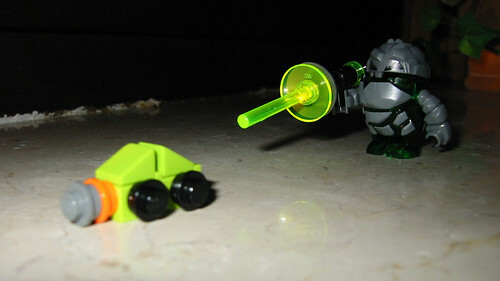 The Remotely Operated Covert Cut-n-Kill is one of the Rock Monster's more devious defenses. Disguised as a Power Crystal-laden rock formation, it has an advanced targeting system, can be operated remotely, and uses recovered Power Miner saws as ammunition. The targeting system is designed to be accurate at up to 100 yards, but it has never been tested at that range in combat situations. Power Miners, in their greed, are inevitably drawn to point-blank range before the firing mode is deployed. Here we see Meltrox considering if another saw is necessary to completely dispatch this poor Power Miner. I cannot deny the awesomeness of what you have described. However I am not sure my building skills are adequate for creating such a thing. I'll give it a try, though! In response to the ever-growing threat of the Power Miners, the Rock Monsters created RARPA, the Rock Monster Advanced Research Projects Agency. Using technology and equipment stolen from the Power Miners, the Rock Monsters at RARPA create formidable weapons to combat the relentless encroachment of the Power Miners. Here's my entry: "Boobytrap Bridge" Two rock monster have boobytrapped a bridge with stolen power miner TNT and now just wait behind their blast shield (made from stolen power miner parts) for prey to come along. (Bridge really blows-up check photostream for video). Last edited by BrandonB9 on Tue Apr 14, 2009 2:34 pm, edited 1 time in total.